The perception among many neutrals and every member of the Sky Sports fixture selection team is that Derby County vs. Leicester City is a passionate, hearty and eagerly anticipated derby match and while that may have once been the case, it’s importance has been dwindling for years. Hyped… A souvenir sold in Tenerife. Just 24 miles separates the cities of Derby and Leicester and with heavily populated towns lying on the borders of Derbyshire and Leicestershire, there would be no real surprise if there was a huge rivalry between the two clubs. In truth, the rivalry has ebbed and flowed for many decades. The Rams first met the Foxes in February 1894, making it the oldest of Leicester’s rivalries. 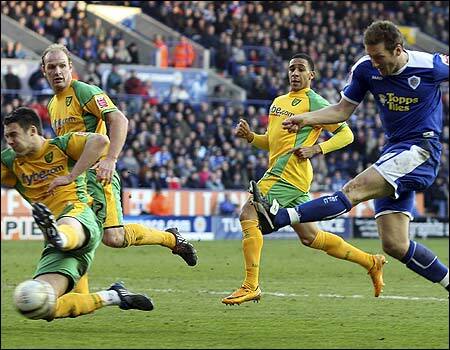 It is also the most contested of the three East Midlands derbies with 104 meetings in the last 119 years. There have been several controversial matches between the two with most, admittedly coming in the last 20 or so years. Leicester defeated Derby in the 1994 Division One play-off final in a game that would become known as the ‘Silence of the Rams’. The two clubs then battled during the late nineties and early noughties in the top flight as both’s preferred rivals, Nottingham Forest were nowhere to be seen. Leicester, in fact hold an impressive record over Derby in recent times with six wins in the last seven meetings. Although, Derby hold the greater record overall with 46 wins to Leicester’s 31. History… Leicester once scored four headed goals at Derby in the opening 15 minutes. Ironically, Derby fans bemoan the lack of history involved in this rivalry citing Nottingham Forest and Leeds United as rivalries for them with greater historical importance due to the switching sides of Brian Clough and his rivalry with Leeds’ Don Revie back in the 1970s. As I’m sure most fans are aware, Derby like to emulate their Red rivals in dismissing Leicester with claims that they “don’t care” about them. Funnily enough, their fans haven’t seemed to have grasped the irony of that statement given their unrequited dislike of Leeds. Leicester see Forest as bigger rivals too due to greater connections in historical and geographical senses. In recent times, City have too begun to see West Midlands, Coventry as rivals. In my rivalry survey from the 2012–13 season, Derby listed Leicester as their third biggest rivals behind Forest and Leeds and Leicester listed Derby as their second biggest rivals, only just beating Coventry. In comparison to Leicester placing as Derby’s second biggest rivals in a similar survey ten years earlier, we can see the decreasing feeling of disdain between the two. In all honesty, a casual reader of The Sun’s ‘Super Goals’ could be forgiven for not noticing the apparent rivalry between the two clubs, as attendances barely increase when they meet. However, this could be due to Sky Sports influence who have screened 4 of the last 5 meetings between the two, not to mention the rising costs of tickets. It’ll probably tell you all you need to know that when the two clubs were drawn to face each other last week in the third round of the Capital One Cup, a third of fans were excited, a third were indifferent and a third were legitimately disappointed at playing just a divisional rival. Uninspired… Poor attendances have the Foxes disinterested. “In my opinion, it isn’t as big as it was – as with many derby games. The intensity of the “derby” has reduced in many years, with the emphasis by clubs on “family friendly atmospheres”, but they are still guilty of trying to talk up a dying act. With Derby, I believe many Leicester fans focus mainly on Forest & Coventry, leaving Derby in the rough – forgotten about in a way. Of course, those that live in areas like Donington, Coalville, and even Loughborough to some extent, will beg to differ, as there’s a wide mix of both Leicester & Derby fans, sparking local rivalries, but nothing on a wide scale. With Derby running down the order, not really challenging for the title, like Leicester and Forest, the competition for “we’re higher than you” hasn’t really been much of a talking point – Such as the dramatic and tight ending of last season, we can all predict who will be up there and who won’t. “Is it a rivalry? Of course it is. 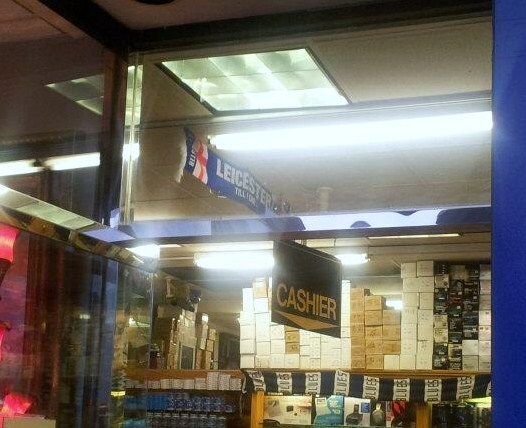 Even though, as all of us Leicester fans know – “we’re all on our own”. Back in the early to mid 90s, when I first started following Leicester, the rivalry was a lot bigger especially if you compare it with today. 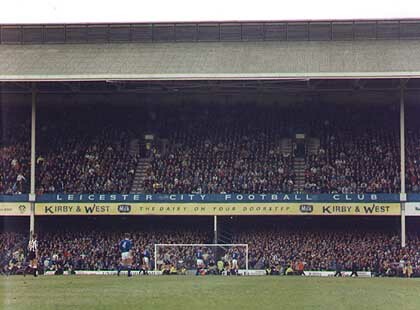 That 3-3 draw at Filbert Street when Iwan Roberts scored that hat-trick. That was intense, local rivalry at its very best. Compare that to how the atmosphere and games between both clubs has been in the last few seasons and it doesn’t even come close for me. Even the teams hated each other back then. It just isn’t like that anymore. Sadly, the new stadia has played a part in the demise of the rivalry. Higher ticket prices and the fans not being as close to each other at games due to segregation means the atmosphere in games is nowhere near what it used to be. 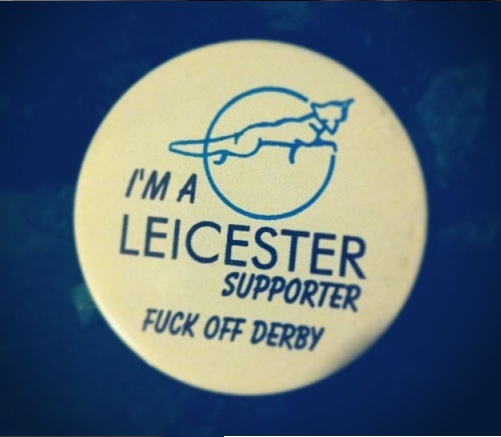 Of course, we Leicester fans know that Forest and Derby hate each other more than they do us. Boo hoo. But for seperate sets of fans to say there is no rivalry is ludicrous. Maybe Derby say that because we seem to get a good return out of them each season and it’s an easy way out? Priorities… Derby fans are distracted by other rivals. “It’s not really dead, it is dying though. Mainly because of the connections between derby and forest fans, the connections of the clubs as a whole. We know each other, we work with each other, the clubs, particularly at the moment have ex staff at their rivals club. Nobody knows a Leicester fan, we don’t share anything, there’s no real history, plus we wind you up by pretending you don’t matter which is having a negative effect on the rivalry. Leicester and Derby are both cities in the East Midlands with football clubs attracting similar levels of support. Leicester is a far larger city population wise, but does have competition from its Rugby team in attracting paying customers. Fans of both sides see Nottingham Forest as their main rivals. Only fifteen miles of ‘Brian Clough Way’ separates Derby and Nottingham, whereas its a much further distance to Leicester. It’s no secret that Derby and Forest both regard each other as their main rivals. I have been a Derby supporter since 1969 and I think that nowadays there is so much more passion in local Derbies. It was there in the 70’s, but it’s taken far more serious nowadays. It sometimes boils over onto the pitch. Just look at the controversy on the pitch during Derby v Forest games and the lack of it when we play Leicester. Derby were successful in the 70’s. as a young lad I saw them champions twice and despite the lack of our red neighbours playing in the same division the Leicester game as I remember didn’t have the buzz about it. It was more atmospheric than now, but back then, unlike today, Leicester didn’t have the beating of us. A rivalry can be stemmed by an incident or history much more than geographical location. There has never been any real bitter feelings between Leicester and Derby. You get odd supporters spats, but search the social media and its not ongoing like with other clubs. When we lost to Leicester in the play off final at Wembley that could have been a spark to ignite the flame, however nothing much has changed. A disputed equaliser and the fact that a former Derby player played a role in the winning goal failed to ignite any real long term rivalry. If a play off final fails to do it then what can? Basically, Derby and Leicester aren’t the greatest of rivals. The sad state of affairs is that Leicester probably get more disdain from Peterborough and Derby probably get the same from Burton Albion these days. Okay, maybe that is a slight exaggeration but the point remains that the fierce rivalry I grew up with in the 1990s no longer exists. Maybe it’s because of Sky, maybe it’s because of ticket prices or maybe it’s because Derby fans like to dismiss Leicester as beneath them, in line with Forest’s superiority complex. Whatever the reason, the meetings of these two clubs will always stir up a bit of interest and excitement but to put it plainly this rivalry is at death’s door. On the night of the 24th July, the day before our flight I accumulated a total of 0 hours sleep. I have an irrational fear of flying and I was definitely not savouring the daunting prospect of an 11 hour trip across the Atlantic ocean. The customary airport formalities went off without a hitch and before I knew it, I was strapped against my will in a steel cage of death precariously hovering over a pool of hungry sharks. Fortunately, my initial terror subsided and was quickly replaced by uncontrollable boredom. There’s only so many crossword puzzles you can do before you start to evaluate the worth of your existence. However, I shouldn’t moan, I caught up on a bit of lost sleep and even enjoyed a couple of films on the journey. We arrived in San Francisco, full of excitement. Dad had warned us that San Fran would be significantly cooler than our later stops in LA and San Diego but following the tumultuous rain we’d had back in England, a temperature of 22°c was nothing to complain about. We swiftly checked in at the Hilton and went off to absorb the delights of the city’s Fisherman’s Wharf area, which can only be described as Skegness Deluxe. That may make it sound like a shithole, but the whole area had a charm about it that made it my favourite part of America’s fog city. Otis…Sitting on the dock of the bay, wasting time. The next morning, we awoke at 6am. Our bodies had seemingly failed to adjust to the eight hour time difference with old Blighty and by 8am we were out on the town. You’d think having been up so early we’d have been able to grab a swift breakfast and dive right in to the many sights and sounds San Fran had to offer. But no. In fact, we hadn’t decided on a café to grab breakfast in until 10am. Although our indecisiveness was initially frustrating, our choice to eat at Boudin was perhaps one of the best of our entire holiday. My Dad went up to order our breakfasts. An order of three traditional breakfasts and one granola and yoghurt. However, being the socially awkward person he is my Dad actually asked for three traditional breakfasts to be smothered in granola and yoghurt. The cashier, rightly confused sought the help of her manager and any misunderstanding was quickly rectified. My father then gave his name, Whiting which he politely spelled out for her so she could call our name when our order was ready for collection. I stood with my Dad to collect the food and Debbie and Holly went to wait for our coffees. About 10 minutes passed and our names still hadn’t been called. Others who had ordered after us had come and gone with their food whilst we were still waiting. At both counters a man named ‘Dwayne’ was being summoned loudly by the staff to collect his food and coffees. After about 5 minutes, it dawned on my Dad that ‘Dwayne’ was not coming and his order was in fact ours. The cashier had mistaken the name ‘Whiting’ as ‘Twaing’. As you can imagine, we were in genuine hysterics as we sat outside and loudly scoffed on our granola-free bacon and eggs. With our bellies full of fried goods, we set off to view the heart and soul of San Francisco, the Golden Gate Bridge, which stood ominously in the fog-drenched distance. We set off on the obligatory six mile walk, stopping for snacks at a local supermarket on the way. 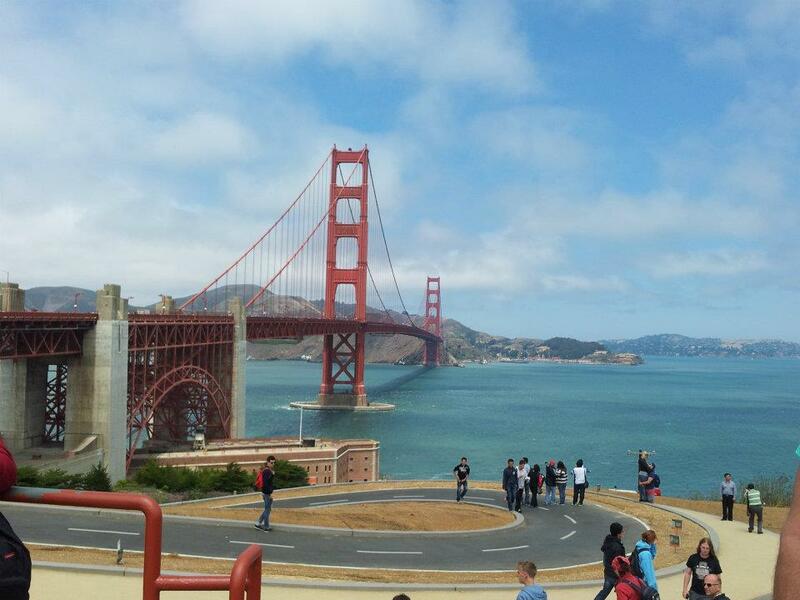 The Golden Gate Bridge was magnificent. It was majestic and bustling with tourists. Perhaps, it didn’t live up to its hype but essentially it is just two red poles sticking out of the sea. We then caught a bus in the hope of viewing Golden Gate Park which was surprisingly a trek and a half from the city’s infamous bridge. Buses in America are weird. They’re crowded, dirty and full of questionable individuals. A bit like a mobile shanty town. Anyway, we were absolutely shot after such a long day on our feet and we ended up ambling for twenty minutes before succumbing to a sit down and a mouth-watering hot dog. In fact, food would become a focal point for the rest of our stay in Frisco. 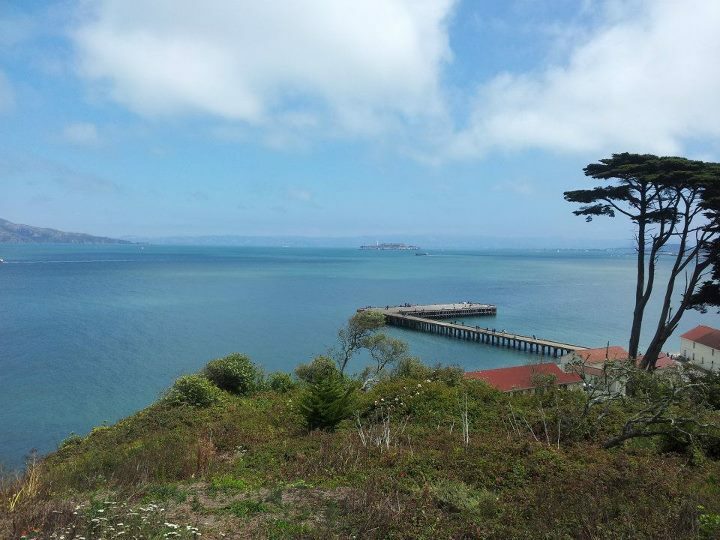 The weather was often overcast and cool and with a dauntingly tall city centre and no chance of visiting Alcatraz to look forward to, the morning croissants from Starbucks were quickly becoming a highlight. In fact, San Francisco boasted several brilliant eateries; The Fog City Diner, a classic American diner that did the classic British dish of fish & chips more than justice. Boudin, also got a second visit from us, this time so we could try Fisherman’s Wharf’s infamous clam chowder which was very tasty. A whole host of lovely restaurants are also homed on the vibrant Pier 39, which again had a classic seaside feel to it.